Tasty Dutch cheese: Leerdammer® Original is the natural yellow Dutch cheese, with an awesomely smooth, nutty and creamy taste. Convenient: Our semi-hard cheese is ready sliced so it's perfect as a sandwich filling or snack. Natural cheese: Leerdammer Original® is vegetarian and lacto free cheese, naturally rich in calcium and protein. It's fine to eat if you're pregnant (the milk is pasteurised) plus it's free of additives. Free-Grazing Promise: At Leerdammer®, we work with our farmers to ensure the best possible level of welfare for the cows including the ability to graze freely outside on grass at optimal times. See our website for more info. 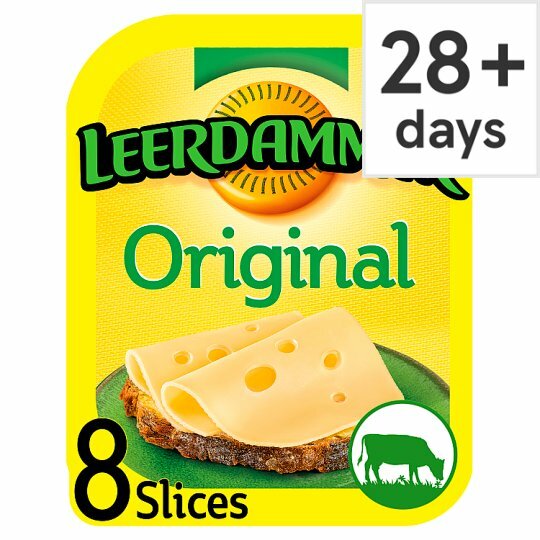 For a smart snack, why not also try Leerdammer® Light natural cheese slices? The same delicious mild Dutch cheese with holes, but with 42% less fat.